This is the plot layout for JAE 2018. You don't need to memorize it or print it, myself, @Karl and @Madfish will be on site to help get everyone looking pretty. It'll be a tricky one to get right but I reckon we'd be up for a good chance of winning an award for it! Last year it was incredibly cosy, which was great, but we had about 4 or 5 groups of people split up around the plot. This layout is designed for a larger social area that encourages us to get to know each other. Believe it or not, I'm not a people person, but with a drink down my neck I'll talk to anyone! Get to know us, we don't all bite! (But Karl will if you wink and shake a bag of Haribo at him). - NO TENTS OR AWNINGS on the show plot. They MUST be on the camping side. - If you want to park closer to your tent, feel free. The show plot is designed to fit 26 vans but can always be reduced on the day. - If you are parking on the camping side, see the second picture for a vague design. We're still showing off our vans so a tasty angle won't go amiss, especially if you've got an awning, it'd be best to be parked with your side door facing towards the tents. - The layout might look tight, but we will have some breathing room on the day. Bear with us if we ask you to move once or twice, we don't want any dings and have in mind that you'd be able to open your doors. (Because we're nice like that). Tents will all be lined up at the back of the plot. 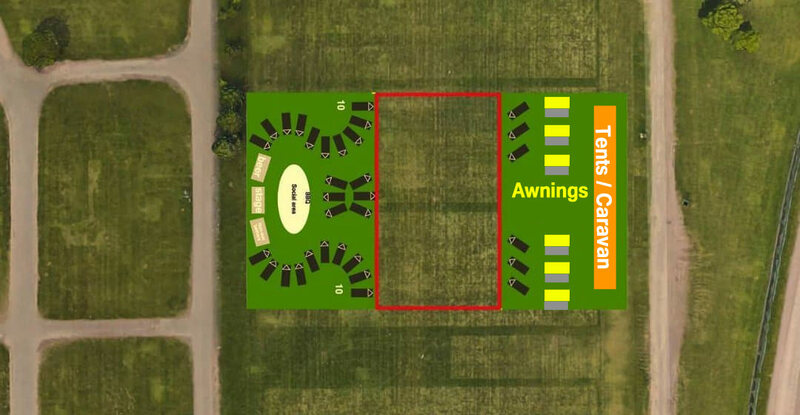 Awnings are highlighted in yellow for their location, they grayed sections are where the van with the awning will park should it be moved to the show plot / to the front of the camping plot. We camped in the quiet area last year and left daisey in the show area.. worked for our family and we all slept well..
We will be in the quiet camping with the drive away awning but will be putting the van on the stand for display every day then returning it to the camp site to re attach to the awning and sleep in the van. Would be good if all the Elgrand owners can be in one place in the quiet camping area. How far is the quiet camping area from the stand this year, wasn't far last time? 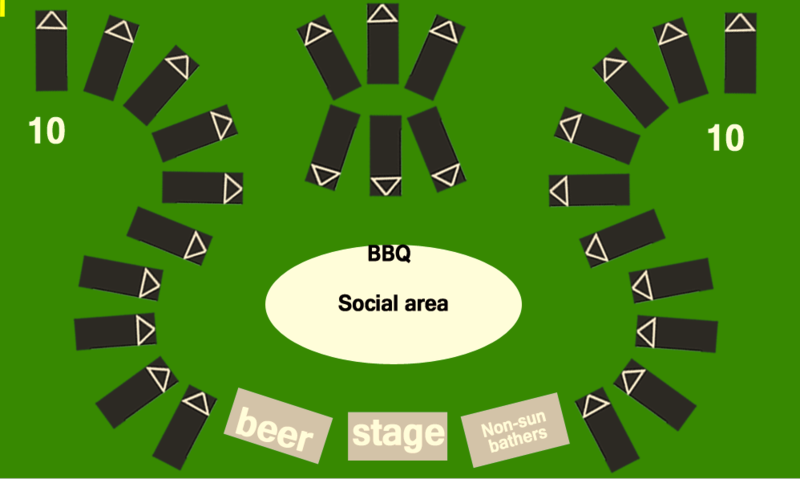 Social area next to the tents sounds no different to last year. Preferably in quiet camping after recent health scare. Cant we put the Caravan where we did last year, over against the boundary fence? it wasn't too far away last year and this year would be closer to the stand. Its near the blue line on the right side, my mrs will not be too pleased if she has to walk too far. I don't know if its an optical illusion but the show field don't seem to have as many plots this year and seems quite a bit smaller than it was as Newark. I've voted as Pop-top but please remember that I'm not arriving until Saturday morning so don't want to be driving over tents!! Perhaps I misinterpret the post be I'm somewhat disappointed that pop-tops seem second class and not worthy of the "showroom" area. @Lize, no, not at all, pop tops are awesome!! All Elgrands are welcome in the 'show' area it's just the pop top people usually wish to have a side awning. We want to keep all the tents and awnings out of the show area to give a cleaner look to the stand, last year it looked like a bit of a random camp site on the stand apparantly. Worded it wrong/it's late/it's early days in planning. Bottom line is this, if you're wanting your van on the social/show plot, you cannot have a tent on it. At all. If you van needs to have a tent/awning attached to it, vote for Camping and help hide all our tents. Especially mine, since it'll probably be the tallest. Ours is a normal. We will be sleeping in a tent pitched up in quiet area..
That's because they keep pi$$ing people off and clubs can't be hassled to attend badly organised shows and taking Thursday away will have had its effect as well. We almost didn't attend too.